Rimor is the number one imported Italian brand into Germany, Europe’s biggest motorhome market. In a country where the Reisemobil is part of the national fabric, and one where there is no end of successful domestic manufacturers, this is no mean feat. Success in Germany is good news for this Tuscany-based brand, which encountered financial problems in 2013 but has bounced back convincingly since then. In March 2015 we reported that Rimor's new coachbuilt line-up had broken cover, taking its place alongside Continental motorhome ranges familiar to many British motorcaravanners: Seal, Katamarano, Europeo and Superbrig. The Koala Elite is a three-strong line-up that succeeds the Koala range – the 722 is an updated version of the Koala 75. Its distinctiveness in the market derives from its adoption of the Renault Master base vehicle, which really sets it apart from the crowd. Like its siblings in the range, distinctive colourways adorn the sides of the 722, rusty brown and grey stripes combining well with the brilliant white panels. Moulded white plastic side skirts will protect the leading and trailing edges of the vehicle from scratches and dings, while up front, further protection is offered by black plastic mouldings on the bottom of the cab and its door panels. The headlight clusters are set high to reduce potential damage in the event of an impact. Inside, you’ll find a sharp and contemporary look that teams light-toned cabinetwork with granite worktops. Seats are upholstered in a chocolate and cream combination with red detailing, which is referenced in the Rimor logo on the travel seat headrest, and behind the cushioned panel next to the mirror outside the bathroom. The same red is picked out in the edges of the curtains and their tie backs as well as in the edging of the overcab bed compartment. It’s a pleasing look overall: smart but uncluttered, although we wonder whether the light fabrics will stand up well to the rigours of family use. The Koala Elite 722 is based on the Renault Master with a 2.3-litre turbodiesel engine producing 125bhp, and motive power goes to a four-wheel rear axle. At a stroke, the Koala Elite has a pretty unique offering: rear-wheel drive, seen by many motorcaravanners as superior to the front-wheel drive chassis that dominate the market, plus twin wheels for stability and extra comfort. With the drivetrain pushing rather than pulling the vehicle, this arrangement makes the 722 especially well suited to lugging large loads in its large rear garage, or towing a trailer. Models supplied to the UK will be available in right-hand drive. Inside, the cab has a very good standard specification, with car-like swivel seats with armrests and a recently updated stereo that includes Bluetooth and USB connectivity. Driving and safety aids include ABS, ESC, hill start assist, Grip Xtend, double airbag, cruise control, electric mirrors and steering wheel controls for the stereo. You won’t go wanting for space in the front lounge. Six people will fit comfortably around the lounge table, with seats to choose from on both sides of the ’van in addition to the travel seats bench. Natural light floods in from a large window on the nearside, which as elsewhere favours nets rather than curtains. There’s no corresponding window on the offside (there’s not much space between the cab and the habitation door), but a small window is mounted high in the overcab. A ceiling light provides further illumination as required. Heating is provided by a Truma unit, with warm air ducted around the vehicle. The 722’s galley is located on the offside and is reasonably generous in length. A hob with three gas burners is located on the end of the kitchen unit, with a sink with mixer tap mounted at the opposite end. To save space for storage, Rimor’s designers have favoured a 150-litre energy-control compressor fridge with built-in icebox, which is mounted under the cooker. A rooflight placed in the gangway between the fridge and the washroom will allow steam and cooking smells to exit the vehicle easily. An out-and-out family motorhome, the six-berth Koala Elite 722 offers buyers three large double beds: a transverse one in the rear, one above the driver’s cab and another double formed by dropping the lounge table and rearranging the cushions on top. The rear bed has a headboard on the offside, with a reading light provided, while the overcab also features an electric light, in this case on a stalk and mounted on the nearside. Access to these berths is effected via a ladder, and a curtain will provide night-time privacy. Another curtain is available for the rear transverse bed. The nearside washroom comprises two areas: a toilet and vanity unit greet you as you enter, while a shower compartment can be found on the left. This can be closed off from the ‘dry’ area via a bi-fold door. To the left of the swivelling toilet is a circular sink in a smart chrome finish, with a matching mixer tap to its left. A towel rail is mounted just under the sink, which itself is mounted in a shelf that extends under the frosted window; this has a pair of toothbrush holders on its right-hand side. Up to six people on tour means carrying plenty of kit and caboodle on board, so it's no surprise that the 722 has a good range of places in which to stow it. At the top of the list is the large rear garage, accessible from both sides of the vehicle via a pair of very tall doors. The flat section towards the rear will accommodate items like cycles or scooters; the space is heated so it can be used for drying winter gear outside of the habitation area. The garage can also be accessed from inside the living quarters, via a hatch under the rear bed. Elsewhere, you’ll find a good selection of overhead lockers, including a pair of shallow and doorless ones above the rear transverse bed. A narrow wardrobe is located between the washroom and the rear bed; opposite that is another cupboard with shelved storage space above it. The kitchen sports a pair of overhead lockers above the cooker and sink, while below that cooks have two cupboards and one drawer in which to store utensils, crockery, pots and pans. Three other overhead lockers are available in the front lounge. Like the ones in the kitchen, they have gloss facings. There are plenty of options you can choose to personalise and enhance your Rimor Koala Elite 722 even further. Air conditioning can be fitted in the cabin with the additional price of £1200 including VAT. Further options include a 135bhp twin turbo engine for the additional price of £1300 (no automatic transmission option), or a 150bhp unit for the additional price of £1500 incl VAT. Automatic transmission is available on this engine, for an additional £1100 incl VAT. Square metre for square metre, the 2016 Rimor Koala Elite 722 is a lot of motorhome for the money – whatever currency you’re shopping in. As supplied to the UK with the specification quoted above, you’ll get £405 change from £40,000 and something that represents very good value for money in return. Using a Renault Master base vehicle for motorhomes could catch on, as it is great to drive and comes with a raft of driver and safety aids as standard, and two engine upgrades are available as cost options. The habitation conversion feels well put together and the interior styling – while not top-end Italian décor – doesn’t look downmarket either. 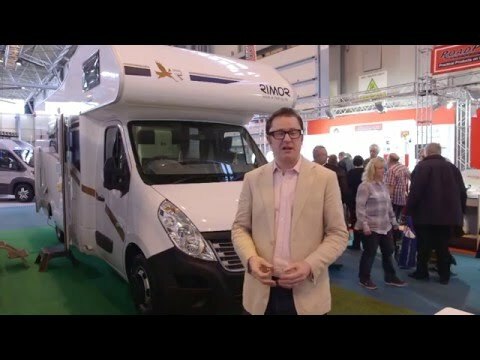 Rimor doesn’t do big volumes in the UK but the Koala Elite 722 is a compelling proposition, especially in late 2015 as the weak Euro is enabling cheaper imports from the Continent. Its traditional overcab coachbuilt lines may not win it any design awards but the affordable and spec-laden Koala Elite 722 is refreshingly honest – what you see is what you get. With sleeping space tucked away in various places on board, perhaps ‘kangaroo’ would have been a more suitable name than Koala, but this cuddly-sounding Italian offering will be a good buy for a price-conscious family looking for some space and comfort on tour.